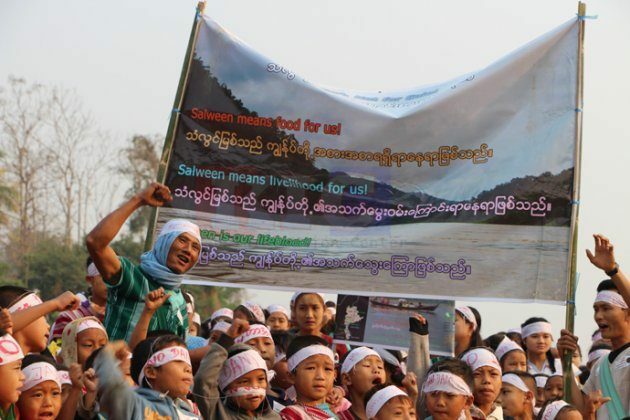 Villagers in the Northern District of Karen State on the Thai-Burma border gathered along the Salween River for the International Day of Action for Rivers and Against Dams. On March 14, the Karen River Network organized event to call for “No Dams” near the Ei Tu Hta internally displaced peoples’ camp on the banks of the Salween River in Mutraw (Papun) district that is controlled by the Karen National Union. Saw Lar Nay Wah, secretary of the Karen Student Network Group, a member of the Karen River Network who took part in the protest, told Karen News that the environment should be protected for future generations. The protest organizers said that building a dam not only destroyed the natural beauty of the river but also destroyed the livelihood and of lives of local people. Villagers and environmental activists don’t want the negative consequences of the dam, and have held protests annually so that their voices will be heard by authorities. The protest was attended by members of the Karen River Network, officials from KNU Mutraw District, environmental activists from Thailand, displaced people from Ei Tu Hta camp, students and villagers from six neighboring villages. Saw Paul Sein Htwa, directory of the Karen Environmental and Social Action Network (KESAN) pointed out in his speech that villagers wanted and needed peace and they did not want dams. Saw Poleh Kalee Lah Moo, a local villager, who joined the protest said he was determined to oppose the Salween River from being dammed. There are a total of 14 hydro-power dam projects proposed along the Salween River through Karen State, Shan State, and Karenni (Kayah) State. Three of them – Wae’ Gyi, Dar Kwin, and Hat Gyi dams are proposed for Karen State. This year is the 16th time the International Day of Action for Rivers and Against Dams had been organized by the Karen Rivers Network. Protests were also held in Mon State, Karenni (Kayah) State, Shan State and at the proposed Hat Gyi Dam site.